The House of Representatives on the national level was designed to be a fair representation of a set geographical portion of the people (districts). States followed by establishing their House of Representatives in the same way. But, as the population shifts and grows, redistricting has become a political tool of the party in power. In 1788 Virginia Governor Patrick Henry convinced his state legislators to redraw the 5th Congressional District to force James Madison to run against James Monroe. He assumed Monroe would easily win, but his maneuver backfired and Madison won the 5th District. His political antic introduced the idea of drawing district lines to get the desired election results or give power to a particular party. To codify this type of political maneuver, in 1812 Governor Elbridge Gerry of Massa chusetts, drew up a redistricting map that was very clearly a partisan map to keep his party in power. When the map was published it was said to look like a Salamander. But, it was said to be worse and was dubbed a “Gerrymander”. 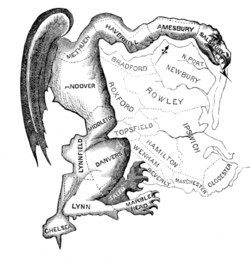 Congress tried to get gerrymandering under control in 1842 with the Apportionment Act. When that didn’t work for the Electoral College votes, initially giving each state a minimum of three votes, Dakota split its state into North and South to double their Electoral votes. The most common methods of gerrymandering are cracking and packing. Cracking is snaking the border around areas, and packing is jamming everyone into a few districts. Prison gerrymandering is another method, counting prisoner as voters when they aren’t allowed to vote. Texas was caught racial mapping to suppress the Hispanic votes. During the Bush administration, they were aggressive in Affirmative Gerrymandering where mapping was majority-minority giving minorities strong voting powers. The courts threw some of them out as overreaching. After a census, there are specialized consultants that go around the country and help states draw their maps with software based on every block. 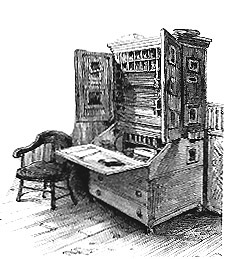 The software is so sophisticated that it can remove and add blocks to get the outcome wanted. Gerrymandering has become a real problem for most of the country because of the lack of independent and middle-of-the-road voters, which would neutralize the gerrymandering attempts. Not so in Oregon. Oregon’s voter rolls have been flipped upside-down with automatic voting registrations when applying for a drivers license (motor-voter). As of July 2018, nonaffiliated voters make up 32% of register voters. When you add them to independents, the make-up of middle-of-the road voters is 36%. It doesn’t take much skimming of moderate voters from the major parties to get a majority. Compare it to 35% Democrat and 26% Republican registered voters. Both parties are guilty of playing games with voters. One suggestion that has been made is to add an efficiency percentage to whatever redistricting model is used. Efficiency percentage is all the wasted votes divided by 100. There is a movement to deem the efficiency percentage over 7% as undemocratic and outlawed. Wasted votes are the votes over 51% plus the losing votes for losing candidates. Six states including California have followed Canada by appointing nonpartisan commissions to draw the redistricting maps with final authority. Unfortunately, nonpartisan is a figment because everyone has opinions and often the appointed commissioners are partisan. But the six states are experiencing closer elections indicating some merit. Oregon Secretary of State Richardson formed a task force in 2017 to assemble the best practices of redistricting reforms from across the country. The goal of the task force was to develop a consensus for proposing redistricting legislation or for possible creation of a citizen ballot measure. The task force recommended that future redistricting be done by an 11-member independent commission (3 Democrat, 3 Republican and five people from minor parties or unaffiliated). Voting approval required 7 votes including at least one vote from each of the two largest political parties. It would take lawmakers out of the process that have an inherent conflict of interest. Attempts failed between 1961 and 2011. As good as this recommendation was, what was filed in the Oregon 2018 session was a watered down version modeled after California, HJR 204. The five commission members must be registered to vote for three years, void of political office in their family and the member may not hold office for 10 years. Four members are selected by the two major party’s leadership in the House and the Senate, and the fifth is selected by the four leadership groups in unanimous agreement that will serve as chair. This issue is sure to be a priority in Oregon’s 2019 session. It will be interesting to see who out gerrymanders the gerrymandering.